87% of the persons questioned in a survey conducted by the Bertelsmann-Stiftung rank the “wish to be healthy” in the first place. Many people think about how to realise this wish by remodelling their surroundings. Today there is a great demand for quality. Great importance is attached to high quality for all kinds of day-to-day items, particularly where health is concerned. It’s by no means a coincidence that there is an increasing demand for “green products” which focus on man and natural environment from production process to distribution. We are right to have a critical look at items that surround us day by day. Many people suffer from allergies due to the increasing environmental pollution. The amount of substances triggering allergies plays a decisive role.Ceramic tiles offer many advantages in this matter. Ceramics have a smooth surface and they are baked at high temperatures so that allergens such as mites and house dust cannot develop and nest. Ceramics offer no basic food resource and no favourable environment for pathogens. Ceramic coverings do not cause allergies and are therefore an ideal solution for allergy sufferers. Hydraulic tile adhesives and grout are emissions neutral and have no effect on the ambient air after being processed. In addition to that they are solvent-free and do not release volatile organic compounds (so-called VOC) which may cause discomfort and diseases. Dust and dirt can easily be removed from ceramic coverings. There is little chance for mould to develop on ceramic coverings and that’s why ceramic is perfectly suitable for the use in rooms with high humidity such as kitchens, bathrooms and toilets. Attention should be paid to good air circulation. Ceramic coverings should be dried and short-term airing can prevent mould from building up. Ceramics are an odourless floor covering. They neither absorb nor store odours, vapours or smoke. 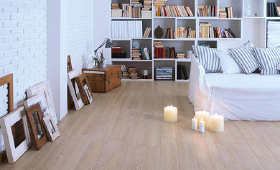 Ceramics have a high thermal conductivity and can even store the heat so they are the perfect floor covering in case a floor heating system is installed. Heating costs can be reduced thanks to their radiant heat. An even heat distribution causes a lower air circulation which means less raise of dust and the air in the rooms is of a better quality.